Hello, forex friends! The September NFP report was a miss, but as I noted in my review of the NFP report, it did improve the probabilities of a December rate hike, which is likely why the Greenback has been steadily climbing at the expense of most of its peers this week. However, we’ve got the retail sales report coming up this Friday (Oct. 14, 12:30 pm GMT). Will this top-tier report put an end to the Greenback’s rally or push it higher? And if you’re planning to trade this event and you need to get up to speed on this report, then this Forex Trading Guide will help you out. The retail sales report is released monthly by the U.S. Census Bureau. And it basically shows the total estimated value of sales at the retail level. The retail sales report is important to both forex traders and decision makers because it is a good gauge for the level of consumer spending or “personal consumption expenditure” in the U.S. economy. And for the newbies out there, consumer spending is of great importance because it is THE backbone of the U.S. economy. U.S. Q2 GDP, for example, grew by 1.4% quarter-on-quarter. And consumer spending was responsible for most of that growth, adding 2.88% to GDP growth, which easily offset the negative contributions from other components. Speaking of GDP, the upcoming retail sales report is for September, which is the final Q3 month. The upcoming reading will therefore give us an idea if consumer spending in Q3 weakened or strengthened compared to Q2. And as I noted earlier, consumer spending is THE major driver of the U.S. economy. Oh, also note that there are two readings: (1) the headline reading and (2) the core reading. The headline reading includes all retail store types while while the core reading excludes sales from motor vehicles and parts dealers since sales from such stores tend to be very volatile. In addition, some forex traders tend to focus more on the core reading, since it is believed to be a better gauge for the underlying trend in consumer spending. However, it is the headline reading that’s looked at when determining GDP. The headline reading for the total value of retail sales in August showed a 0.3% month-on-month contraction, which is a much harder drop than the expected 0.1% tumble. But on a more upbeat note, the headline reading for July was upgraded from a stagnant 0.0% reading to a slight 0.1% increase. But on a more downbeat note, the contraction in August was the first negative reading in five months and also marks the second consecutive month of deteriorating readings. Moving on, the core reading also took a hit, contracting by 0.1% month-on-month when it was expected to print a 0.3% increase. This marks the second straight month that the core reading has been in the red. That’s bad enough, but to make matters worse, the core reading for July was also revised lower from -0.3% to -0.4%. Looking at the details of the report, the contraction was pretty broad-based since 9 of the 14 retail store types reported lower sales, which is why the core reading also took a hit. The main drag, however, appeared to be the 0.9% decline in vehicle sales. Vehicle sales are stripped from the core reading, as I mentioned earlier, which is why core reading had a softer drop compared to the headline reading. Overall, the retail sales report was pretty bad no matter how you slice it, which is why the initial reaction was to dump the Greenback. However, the Greenback was quickly bought back up before proceeding to trade sideways. The likely reason for this is that forex traders were wary of being too committed on their positions, given that another top-tier economic report was coming up. To be more specific, forex traders were likely waiting for the CPI report to be released, and that turned out to be better-than-expected (0.2% vs. 0.1% expected, 0.0% previous). For the month of September, economists forecast that the headline value of retail sales will increase by 0.6% month-on-month. If vehicle sales are excluded, then economists expect a 0.4% increase. Economists are therefore expecting both the headline and the core readings to recover from the previous month’s disappointment. Looking at some of the available leading indicators, annualized total vehicle sales in September climbed by 4.47% to 17.76 million (17.00 million previous), so we can probably expect a nice, solid boost in retail sales, at least for the headline reading. Next, ISM’s non-manufacturing PMI for September soared from 51.4 to an 11-month high of 57.1. 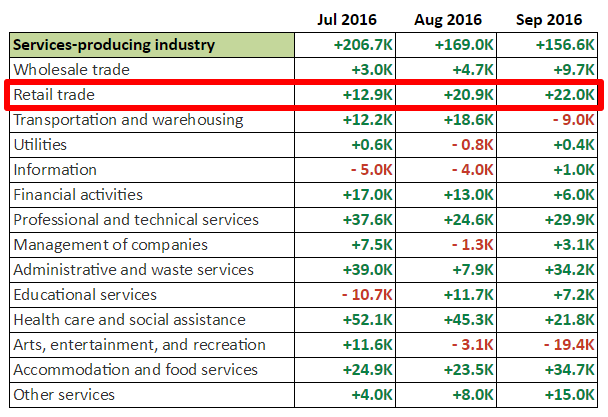 The details of the PMI report also noted that retail trade was one of the 14 industries that reported growth in business activity, with one survey respondent saying that: “Sales continue [at an] increased pace from last month.” Retail trade was also one of the 13 industries that reported growth in new orders, as well as one of the 9 industries that increased employment. 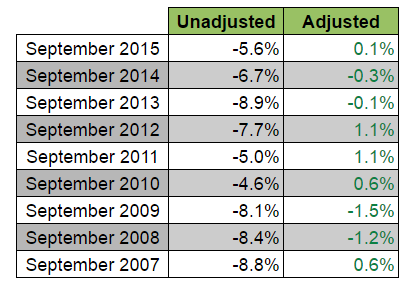 That last bit about employment is confirmed by the latest NFP report, as you can see on the table below. Speaking of the NFP report, the September NFP report was a miss overall, including wages. However, wages did grow by 0.2%, which is a faster rate of increase compared to August’s 0.1% increase. And that hopefully translated to higher consumption. Overall, the available leading indicators appear to be pointing to a stronger retail sales reading for the September period. The consensus readings therefore look about right. As for the chances on whether the actual reading will meet or beat expectations, that’s pretty hard to gauge, given that we’re looking at the percentage changes and not the actual numbers. Also, the previous readings are subject to revision, which further messes up the percentage changes. One thing we do know is that unadjusted numbers for the month of September always show a large contraction while the seasonally-adjusted reading is always higher than the unadjusted reading. However, that doesn’t automatically translate to a higher tendency for a better-than-expected reading. In fact, the readings for the past few years have been misses. Anyhow, just keep in mind that stronger-than-expected readings tend to trigger a quick Greenback rally while a miss usually triggers a quick selloff. Also keep in mind that Fed Head Yellen has a speech at 5:30 pm GMT, so there’s a chance that the initial reaction won’t have a lot of follow-through until then, unless the readings significantly beat or miss expectations.